Barking is a dog’s natural method of communication. However, if a dog barks for a long time it may cause problems for the owners with the neighbours complaining. A dog that barks constantly may lead to the local authority serving a noise abatement notice on the owners. Constant barking may also be a sign that the dog is distressed. So what should you do if your dog barks a lot? First, you need to find out why. If your dog only barks when you are out then it is useful to set up a video camera to record your dog’s behaviour when he is left alone. Frustration at seeing people or animals outside the house that he cannot reach. Frustration and boredom because he has nothing to do. Fear where the dog is frightened of something such as an unexpected noise in the home. Dogs may bark, howl or whine because he cannot cope with being left alone. Dogs are naturally social animals and it is not normal for them to be left alone for long periods of time. Responding to another dog barking. For attention – in this case the dog will bark for no apparent reason but stop when the owner gives him attention. Illness or injury can also be a cause of barking. As dogs age their hearing can change which may cause them to bark more. So what can you to do reduce your dog’s barking? Leave your dog in a quiet room or make him a den where he can feel safe and is not disturbed by outside noises. Draw curtains and blinds or move furniture so he cannot see out of the windows. Take him for a long walk before you leave him – tired dogs are less inclined to bark. Arrange for a reputable dog walker or doggy day care to walk him or look after him while you are out. Give him a food toy such a Kong or a long lasting chew that will keep him occupied. If you have tried these things and the barking continues then it might be worth consulting a professional. 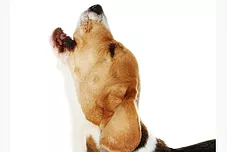 Don’t punish your dog for barking it might make him more anxious and inclined to bark more. Don’t shout at your dog when he barks, from the dog’s point of view it might seem as though you are joining in with him. Don’t use devices such as anti-bark collars – they usually make the problem worse.